Yesterday, in a press conference, Secretary Clinton said, "We support the fundamental right of expression and assembly for all people and we urge that all parties exercise restraint and refrain from violence," adding, "But our assessment is that the Egyptian government is stable and is looking for ways to respond to the legitimate needs and interests of the Egyptian people." Yet, one thing Crowley said stuck out among the repetitions. At one point, he called the Mubarak government "an anchor of stability in the Middle East." This phrase is strikingly reminiscent of what President Jimmy Carter said thirty-three years earlier with regard to the unflinching U.S. support, both vocal and material, of the Shah of Iran's brutal dictatorship. Carter, speaking at a New Years Eve state dinner in 1977, called the Shah's Iran "an island of stability" in an otherwise turbulent Middle East. Carter said this at a time when in Iran, under the Shah's tyrannical rule, "dissent was ruthlessly suppressed, in part by the use of torture in the dungeons of SAVAK, the [US and Israeli-trained] secret police," as reported in a Time magazine article from January 7, 1980. Another CIA report, this one from mid-1978 and entitled "Iran After the Shah", affirmed that "Iran is not in a revolutionary or even a 'prerevolutionary' situation." On October 27, 1978, the CIA issued a report that suggested "the political situation [in Iran] is unlikely to be clarified at least until late next year when the Shah, the Cabinet, and the new parliament that is scheduled to be elected in June begin to interact on the political scene." Just a few months later, in the face of a massive popular uprising representing the end of millennia of monarchy in Iran, the Shah and his wife Farah fled Iran in early 1979, never to return. They flew to Egypt, of all places, where they received a warm welcome by Anwar Sadat. A year and a half later, the Shah died in Egypt, was given a state funeral, and was buried in Cairo at the prestigious Al-Rifa'i Mosque. "Look, Mubarak has been an ally of ours in a number of things and he's been very responsible on, relative to geopolitical interests in the region: Middle East peace efforts, the actions Egypt has taken relative to normalizing the relationship with Israel. "And I think that it would be -- I would not refer to him as a dictator. Naturally, Lehrer should have known better than to ask Biden such a silly question. Everyone knows that well-paid and well-armed world leaders subservient to the United States and complicit in Israeli war crimes can't possibly be dictators. 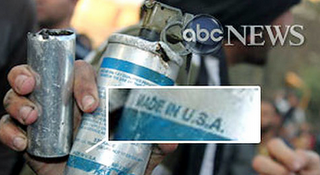 Joe "I am a Zionist" Biden was merely stating the obvious. Meanwhile in Israel, the situation in Egypt has not caused much concern. Ma'an News Agency reported on Thursday that an Israeli "cabinet minister, speaking on condition of anonymity" told journalists that because the "Egyptian regime is well-rooted, including the defense establishment," it "is strong enough to overcome the situation." When asked whether Israel supports the anti-despotic nature of the protests and encourages pro-democracy demonstrators, the official responded, "Looking at the Middle East situation, I'm not sure the time is right. We look at democratization as a longer process." Translation: U.S.-backed dictators ensure Israel can continue to steal Palestinian land and commit war crimes against the Palestinian people; therefore, allowing the Egyptian people to chose their own government (potentially one which might not bow down to U.S. and Israeli diktat) is a dangerous proposition for Israel as it may reduce Israel's ability to colonize and ethnically cleanse Palestine with impunity. Ergo: the time for democracy is not right and never will be and the longer process of democratization really means the necessity of the United States and Israel to manufacture the results with both money and bullets. Obviously, allowing Arabs to speak for themselves tends to produce frustrating results for the U.S. and Israel. Better to support a dictator instead. January 28, 2011 - The White House - piling onto recent declarations by both the State Department and the Vice President - has stated its belief that the Mubarak regime in Egypt is "stable" and retains U.S. support. Asked during yesterday's press briefing if "the White House believe[s] that the Egyptian government is stable," spokesman Robert Gibbs responded flatly: "Yes." "Well, again, Dan, I think it's important to -- this isn't a choice between the government and the people of Egypt. Egypt, we know -- and President Mubarak has for several decades been a close and important partner with our country." Later, Gibbs claimed, "This is not about taking sides," and affirmed that Egyptian President Mubarak "is a close and important partner" of the United States. Gibbs also made sure to note the "obligation by the [Egyptian] government not to engage in violence," adding, "There's an obligation by those that are protesting not to engage in violence by burning government buildings." With this in mind, it might be instructive to recall what Gibbs said in response to the post-election protests and rallies in the streets of Tehran. On June 16, 2009, Gibbs relayed the belief that President Obama saw the demonstration as "a vigorous debate inside of Iran by Iranians about who is going to -- about the leadership in their country. And as he said this afternoon, it's not a good idea to meddle in that sovereignty." The following day, Gibbs reiterated the position that "this is a debate that is being had by the Iranians about who they're going to choose," and also pointed out that Obama "is heartened and has been heartened since the election of the enthusiasm that you see particularly in the youth of Iran." 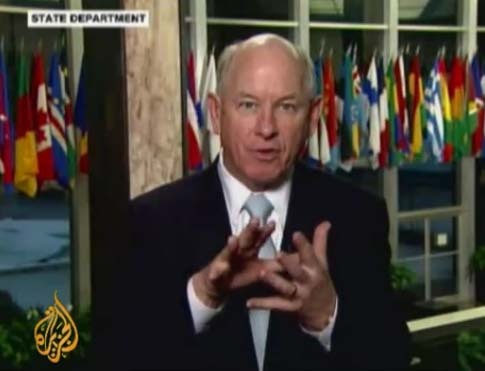 Speaking again on June 18, 2009, Gibbs made clear the White House opinion "that people in Iran know of our belief that they have the right to have their causes and concerns heard and not fear violence, while at the same time respecting that this is a debate being had in Iran, by Iranians, about their leadership." President Obama himself released a statement on June 20, 2009 which declared, "We call on the Iranian government to stop all violent and unjust actions against its own people." What was missing from all of these statements, among other things, was any mention of protester violence on the streets of Tehran. Whereas Gibbs urged Egyptian demonstrators not to burn government buildings, this request was missing from his and his boss' statements about Iran a year and a half ago, even though Iranian protesters set government compounds ablaze in the days after the presidential election. January 28, 2011 - War criminal and world-class jackass Tony Blair was interviewed on BBC Radio 4 today. He made clear his distaste for Arab self-determination and revolution, especially if the result doesn't serve Western and Israeli interests, saying, "When you're actually looking at how this evolution takes place, you are aware that it's got to place in a stable way." When confronted with the facts that Western, including British, governments have long helped the Mubarak regime suppress opposition movements and stifle pro-democratic advocacy in Egypt, Blair admitted that was a "fair point to make." Blair then explained that government leaders are all "in the difficult position" of balancing the desire "to see change" in authoritarian regimes supported by the West and having that change "happen in a way that keeps the region together." He then demurred, saying, "Look, this is not my focus now, my focus is on the Israel/Palestine question." Clearly, according to Blair, "keep[ing] the region together" obviously means the maintenance of Western control over Arab dictatorships and making sure that Israel is never held accountable for its war crimes and crimes against humanity. January 28, 2011 - Warmongering Zionist maniac John Bolton was just interviewed on Fox News. He spent most of the time warning of the danger of Egypt's Muslim Brotherhood and other "radical Islamists" taking over the protests, which, in his words "constitutes a direct threat to the military government." He also said that the "failure of other security forces to bring the demonstrations under control explains the presence of the [Egyptian] military" now on the streets. Bolton added that the "military establishment" which has ruled Egypt for decades "will not go peacefully." "I don't think we have evidence yet that these demonstrations are necessarily about democracy," Bolton declared. "Let's be clear what the stakes are for the United States: we've got an authoritarian regime in power that's been our ally. We don't know at this point what the real alternatives are." When asked about the "cautious statements" made by senior U.S. officials regarding the situation in Egypt, Bolton expressed disappointment, but not for the lack of support given to the Egyptian people's right to self-determination and freedom from despotism; rather, he was angry that anyone had said anything at all. "This is a case where we are far better advised to remain silent, try to understand better what's going on, what the stakes are, rather than making statements that other people are parsing to say, 'Oh, they're supporting the demonstrators. Oh, they're supporting the government.' I think there's confusion inside the administration." "I don't think that just because you have people climbing onto tanks, you can assume that they are friendly to democratic values. I think there's a lot of opposition to the regime and a lot of opposition by the Muslim Brotherhood that's determined to bring down this secular, military government and install one of very harsh Sharia law, which would have enormous implications for the United States, for Israel, for other Arab governments in the region. You just mentioned the Suez Canal. 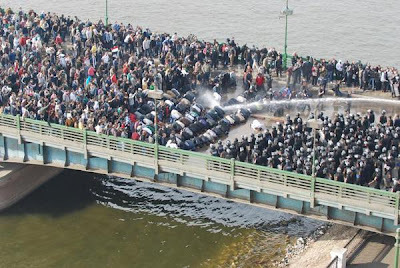 How'd you like the Muslim Brotherhood in charge of that waterway?" Bolton concluded his segment by suggesting the U.S. government should steer clear of making any statements regarding Egypt at this time: "The Obama administration should remain prudently silent publicly and be working behind the scenes to try and find out, to try and understand better what the ground truth really is in Cairo and other major cities." Let's recall June 2009, when the same John Bolton spoke to Fox News about the official U.S. reaction to protests in Tehran. He accused Obama of being both "timid" and "disingenuous" by not forcefully speaking out in favor of Iranian demonstrators and against the Iranian government. "[Obama] is abandoning the people in the streets and not providing any possibility of concrete assistance to them," Bolton said then, despite the fact that he admitted that in "this potential revolutionary moment, we're not really in a position now to offer much concrete assistance." Still, as he did today with regard to Egypt, Bolton urged prudence. "I’d rather be a little bit prudent," he said, "and prepare for the long-term where we really can provide concrete assistance." It probably does not even need pointing out that John Bolton has long supported the exiled Iranian Islamist/Marxist terrorist cult Mojahadeen-e Khalq (MEK), which is currently designated a Foreign Terrorist Organization by the U.S. government. So, to sum up: Bolton urges silence from the United States regarding indigenous Egyptian popular opposition, but material support for an Iranian exiled terrorist opposition group that has virtually no support within Iran itself. The bottom line: U.S-backed authoritarian regimes that protect Israel are good, just as anti-Iranian dissident groups that murder Iranians are also good. Thanks for clarifying, John. Shortly thereafter, speaking on Al Jazeera English, the European Union's foreign policy chief Catherine Ashton echoed Crowley, saying, "It's very important that we see restraint and calm, it is very important that the [Mubarak] government tries to achieve this...that is their responsibility." Ashton made clear her feeling that Mubarak still had a central role to play in shaping the future of Egypt, rather than heeding the will of the Egyptian people by relinquishing his long-held post as U.S.-backed dictator. "It's not for me to call for [Mubarak] to stand down. He needs to be in dialogue [with the people] and work the process out with them so that they can feel confident with the transition," she said, continuing, "The job of the government in any country is to listen to the people and respond. If the people are saying we want change he has to demonstrate that he’s listening to that." Mubarak "must show the people he has heard their message and is responding to them, show them a timetable to move forward," Ashton said, later stating that Mubarak "must talk to the leaders of the demonstrations, the opposition." Clearly incapable of understanding that Mubarak is no longer in a position to negotiate the terms of his dismissal or the transfer of power to a new government, Ashton reverted to pallid platitudes, devoid of specifics or meaning. "We in the EU want to see Egypt move forward...Then we can all work with the transition to make sure we're supporting Egypt into the future - with elections, democracy, human rights, combined with the economic and political support we can give," she said. "Above everything," she stressed, the situation in Egypt needs to be "calmed down." "The United States deplores and condemns the violence that is taking place in Egypt, and we are deeply concerned about attacks on the media and peaceful demonstrators. We repeat our strong call for restraint." "After days of peaceful protests in Cairo and other cities in Egypt, today we see violent attacks on peaceful demonstrators and journalists. The United States denounces these attacks and calls on all engaged in demonstrations currently taking place in Egypt to do so peacefully. "These attacks are not only dangerous to Egypt; they are a direct threat to the aspirations of the Egyptian people. 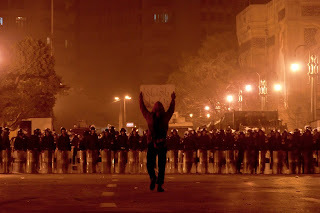 The use of violence to intimidate the Egyptian people must stop. We strongly call for restraint." Still refuses to actually call out Mubarak regime specifically, but possibly gearing up for that in the near future. Oh right, he also calls for "restraint." Strongly, this time. thanks for always sharing great insight. I recently visited Collodi, the town where the author of PINOCCHIO wrote the famous fable. In that town there is a huge statue of Pinocchio: it dwarfs in the face of the many US puppets and marionettes weaving (and acting out) some of the most creative fables of US Exceptionalism.
. Not to speak of the many Geppettos behind the scenes! Did you just write an eloquent, well-reasoned article on the American government's history of propping up Middle Eastern dictators? I fear that you, sir, an an anti-Semite. On a more serious note, thanks for a great blog. It's always fun to find someone recognizing the standard 'advertising copy' and I quite enjoyed this piece. When I read up on the Partition of India in Wikipedia, the descriptions of Pakistani guerilla actions were just as if they were written today. It should be worth a smile of recognition. Under the auspices of Freedom House, Egyptian dissidents and opponents of Hosni Mubarak were received in May 2008 by Condoleezza Rice at the State Department and the US Congress. They also met White House National Security Adviser Stephen Hadley, who was "the principal White House foreign policy adviser" during George W. Bush's second term. Freedom House’s effort to empower a new generation of advocates has yielded tangible results and the New Generation program in Egypt has gained prominence both locally and internationally. Egyptian visiting fellows from all civil society groups received [May 2008] unprecedented attention and recognition, including meetings in Washington with US Secretary of State, the National Security Advisor, and prominent members of Congress. In the words of Condoleezza Rice, the fellows represent the "hope for the future of Egypt." I don't get over to Global Research nearly enough. That's an excellent example of the dissembling that is foreign policy. And of course, this is global strategy.